“At the heart of our work are the women,” explains Gilda Larios, ESPERA Team Lead. This is the profoundly intentional notion behind the ESPERA community lending program, which increases women in Central America’s income, autonomy, leadership skills, dignity and well-being. Integral to this holistic approach is ESPERA staff’s accompaniment of the women by facilitating conversations, encouraging participation, and supporting the women to create and achieve a common vision of success during regular visits with each of our eight partner organizations. Meeting regularly with Mary’s Pence staff provides transparency and accountability, and creates a safe space to regularly evaluate the program together, as well as time for celebration and reflection. Each group of women with an ESPERA lending pool is unique and dynamic. One of the most challenging, but perhaps most impactful aspects of accompaniment is Gilda’s assistance with organizational transitions. Gilda has the patience and gentle persistence to do this well. 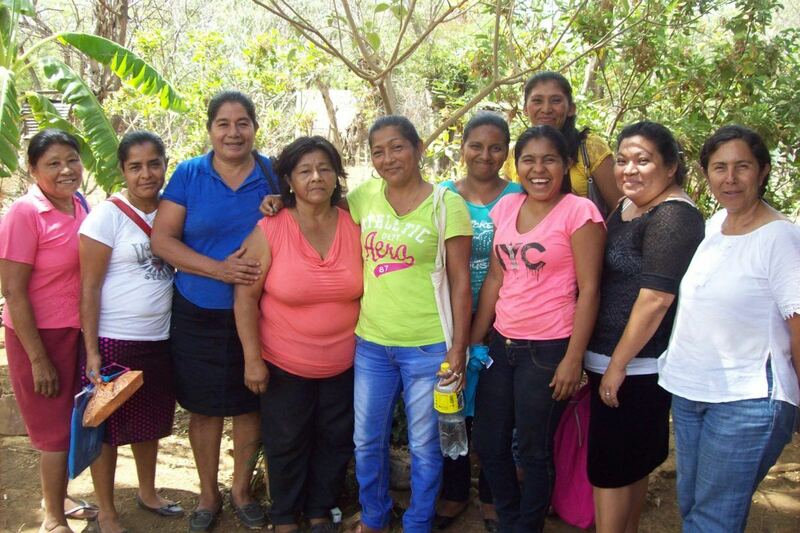 This is the story of how Gilda accompanied our partner, Red de Mujeres de Nicarahuatl (The Red) which translates to Network of Nicaraguan Women, through a successful transition of the ESPERA Fund to stronger and more active group, CEPROSI. In 2003 Mary’s Pence had several grantees in Nicaragua, and these wonderful women gathered and formed a network of women’s groups called The Red de Mujeres de Nicarahuatl (The Red). Initially four groups working in local communities were involved, and their goal was to strengthen economic initiatives of the women so that they could gain independence and leadership. By 2006 the network had grown to 12 groups. They conducted annual assemblies to share their work and learnings, and the groups individually continued to receive grants from Mary’s Pence. With the goal of increasing local ownership and leadership, Mary’s Pence transitioned responsibility for follow-up with the grantees to the local organizational leaders. In 2008 Mary’s Pence formed ESPERA, by partnering with grassroots women’s organizations in Central America and Mexico to start community lending pools that are owned by the local women. Following the path we had started with The Red to increase leadership and ownership, they became one of the first ESPERA partners. The first year they received funding through the Mary’s Pence Grants program in addition to the initial funds for their ESPERA lending pool. Our goal was to transition the group from grant to loans, to increase their independence slowly with accompaniment from the Mary’s Pence staff. This transitioning proved difficult for some of the women, as many women did not have previous experience having to pay back funds. Three women were elected to the first ESPERA leadership team. All three were single women facing economic difficulties. As The Red was learning to circulate the money, it was discovered during an assembly that one of the leaders took an unauthorized loan. Gilda facilitated a series of discussions with the women, who decided how to transition the leadership, and a payment schedule for the woman involved. In 2010 another leader took an unapproved loan. With the previous experience in mind, when one member discovered the issue, she had the strength and skills to stand up for the rights of the group. Again, with Gilda’s accompaniment a payment schedule was made. Both women are working toward repayment of their loans. Through these unexpected leadership issues, Mary’s Pence learned that economic worries made it difficult for women to dedicate extra time as volunteer leaders to the work of ESPERA. Because most of the women have multiple small streams of income, time taken from any of them is a hardship. In many locations Mary’s Pence now supplies a stipend for the women who take on this leadership position coordinating the lending pool. This learning has increased the strength of the ESPERA program and encourages more women to participate in leadership roles. Over time some of the member organizations of The Red experienced changes in mission, internal communication issues, and fading commitment from individuals to the economic focus of The Red. Some members also felt strained by having to travel long distances to meetings. As each group’s commitment waned, Gilda guided The Red through a process of discernment in which everyone’s voice could be heard. Ultimately, many of the groups came to mutual agreement to end their membership with The Red. While this process was sometimes difficult and emotional, Gilda’s respect for each woman’s experience meant that everyone left feeling content. After a period, it was becoming clear that The Red was struggling to maintain members, and that one organization of The Red was most committed to circulating the ESPERA lending pool – CEPROSI. Around the same time, The Red began experiencing difficulties with their local bank. In Nicaragua, gaining legal status as an organization is complex and costly. Because of this, The Red was not a formal organization. Therefore, they did not have a business account with the bank. Instead, the women with loans would go to the bank and make their monthly payments into an individual account of one of the leaders. However, the bank began to push back on this process and would no longer allow it. However, CEPROSI did have legal status as an organization. At this point it was decided to use their bank account instead of an individual’s. This need to transition the funds created an opening for the discussion of the sustainability of The Red and the commitment of CEPROSI. Gilda held many meetings with leaders of The Red and CEPROSI over the course of a year and a half. Over time the conclusion became clear. The women of CEPROSI truly had the energy and the interest in business initiatives. In March 2016 the group agreed to put The Red on hold and transition the ESPERA funds to CEPROSI. In July 2016 the ESPERA lending pool funds were officially turned over to CEPROSI, and they became Mary’s Pence new ESPERA partner in Nicaragua. CEPROSI consists of 8 groups of 68 women. The economic initiatives of the women include raising animals – chickens and pelibuey (cross between goat and sheep); managing small shops or tiendas; artistry with decorative corn husks called tusa; canning vegetables; making and selling medicine and shampoos; buying and processing tamarind in bulk; and selling homemade cakes, clothing, vegetables, peanuts and piñatas. In February Gilda attended CEPROSI’s first formal meeting with all its members to update them on their ownership of the funds. At this meeting, Gilda supported them in deciding upon a new structure of leaders. Each of the 8 member groups will have a representative on the leadership team, and they also elected four leaders for the group as a whole. In April of 2017 a meeting was held by these 12 women to outline how they will manage the ESPERA program. A follow-up meeting with Gilda and the leaders will happen this July. Before then, all eight groups will be visited by the newly appointed leaders. Auxiliadora, the former bookkeeper for the Red will now support CEPROSI by doing the accounting. Mary’s Pence will continue our accompaniment and financial support. Without putting the women intentionally in the center of the work, Gilda would not have been able to provide the flexible and responsive support Mary’s Pence desires to provide our ESPERA partners. In social justice work nothing is static. Mary’s Pence provides uniquely valuable support through her nurturing guidance. Learn more about ESPERA Community Lending.